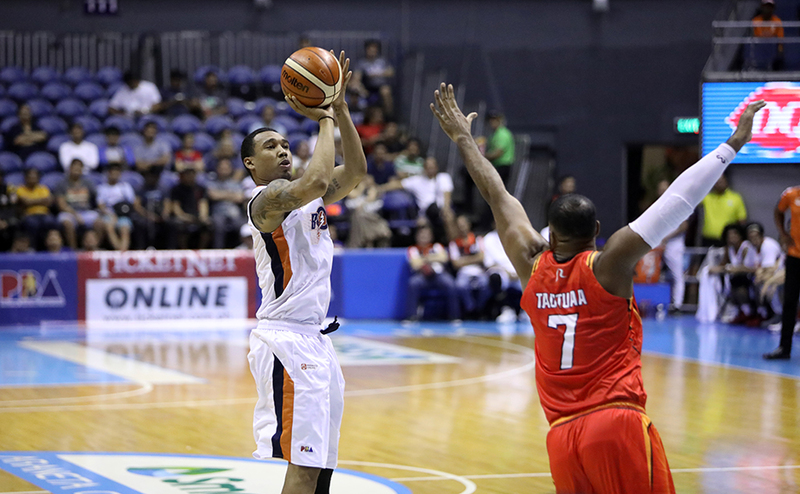 The Meralco Bolts pulled off a last-gasp run to push the game into overtime. In the extra periods, they were able to outlast the NorthPort Batang Pier, 126-123 to earn their third win of the conference. They rise up to 3-5 while the Batang Pier fall to 2-5. It looked like the Batang Pier had the game wrapped up with 30 seconds left in the fourth quarter. Stanley Pringle knocked down two free throws to give his team a six-point lead. But Bolts didn’t give up on the game. After a timeout, Chris Newsome grabbed an offensive rebound and was fouled on his shot attempt. He buried both freebies to cut the lead down to four. Meralco was able to force a turnover on the next possession, giving them the ball back with six seconds left. He had John Pinto inbound the ball and Baser Amer use a Reynel Hugnatan screen at the top of the key. Amer ran all the way to the left corner with his defender trailing him. But that was all a decoy as Newsome used a Ranidel De Ocampo screen near the free throw line to get a free run to the hoop. Pinto lobbed the ball perfectly to a wide-open Newsome for the game-tying basket, sending the game to OT. In the first OT, the Batang Pier built another two-possession lead only to see Bolts cut it down. After Amer and Newsome nailed clutch baskets to bring the lead down to two, Nico Salva saved Meralco when he scored on a put back with 35 seconds left to send the game into a second OT. In the second extra period, Amer hammered down the nail in the coffin. He drilled back-to-back triples to give Meralco an eight-point lead. That was enough of a cushion to secure the win. Newsome led the Bolts with 28 points, 12 rebounds and seven assists. Amer and Hodge had 23 points each. Pringle and Sean Anthony led the Batang Pier with 33 and 31 respectively. In the second game, the San Miguel Beermen dominated the NLEX Road Warriors from start to finish. They led by as much as 31 points in the 121-111 win. The Beermen won their third straight game rising up to third in the standings at 5-3. NLEX stays at 10th with a 2-5 record. The Beermen opened the game with a 28-4 run and never looked back. It was an absolutely dominant start to the game anchored by strong performances from the San Miguel starters. Arwind Santos was on fire to start the game. He nailed three straight treys to propel San Miguel to a 9-0 start. 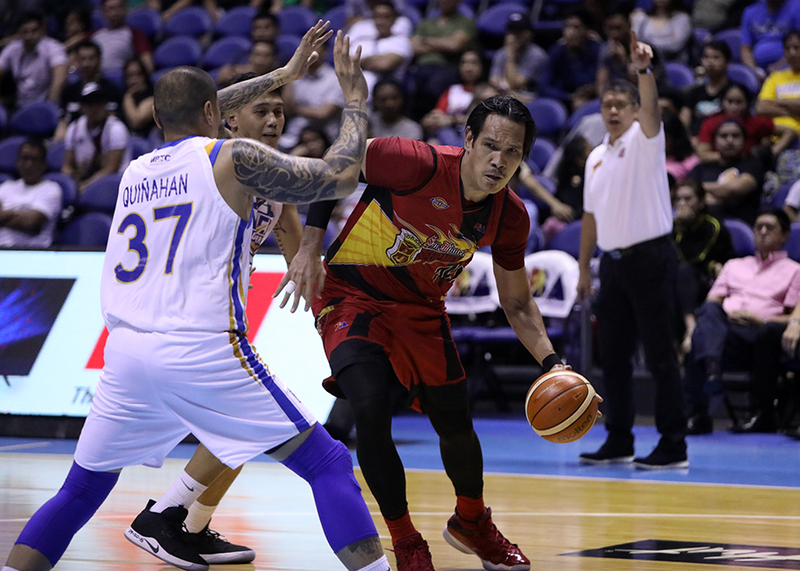 After Asi Taulava got NLEX on the board, the Beermen went on a 12-0 blast as Alex Cabagnot, June Mar Fajardo and Marcio Lassiter all joined in on the scoring barrage. Fajardo punctuated the monster run with a surprise three-pointer to give San Miguel a 24-point lead. NLEX eventually got their shots to start falling but at that point, the Beermen were already rolling. San Miguel kept a safe distance all game long. They opened the third quarter on a 10-4 run to increase their 25-point lead to 31. They cruised to the win from that point on. Fajardo was a beast in the middle. He finished the game with 27 points and 13 rebounds. Six other players scored in double figures for San Miguel including all the starters and two other bench scorers. Cabagnot had 18, Santos finished with 17 and Lassiter had 16. JR Quiñahan had 17 points to lead the Road Warriors.